Selenium Job Responsibilities may vary from one company to another and one project to another, but I am covering this topic by considering several companies approaches or in general orientation. > TestNG or other Supported Testing Framework for Grouping Test Cases, Prioritizing Test Cases, Executing Test Batches and Generating Test Results. > Selenium Grid for Parallel Test execution. > Maven Integration for creating and maintaining Selenium Test Environment. • Good Knowledge on Web Environment, Web Elements and Operations on the Web Elements. • Basic Understanding of Functional and Regression Test Automation. • Good knowledge on Selenium suite of Tools (Selenium IDE, Selenium RC, Selenium WebDriver and Selenium Grid). • Knowledge of Java Programming (Data Types, Variables, Operators, Flow Control Statements, Methods (Built-in as well as User defined), Exception handling, File Handling, Excel file Operations, Database Operations and OOPS concepts). • Good knowledge on Element Locators, Inspecting Elements and Selenium WebDriver API Commands or Methods. • Ability to create & execute Test cases using Element Locators and Selenium WebDriver API Commands. • Generating Test Cases (Test Scripts) using Selenium Element locators and WebDriver API Commands. • Enhancing Test cases using Java Programming. • Creating Test Automation Resources (Function Libraries etc…). • Handling duplicate objects and dynamic objects using index property and Regular expressions. • Collecting Test Data for Data Driven Testing. 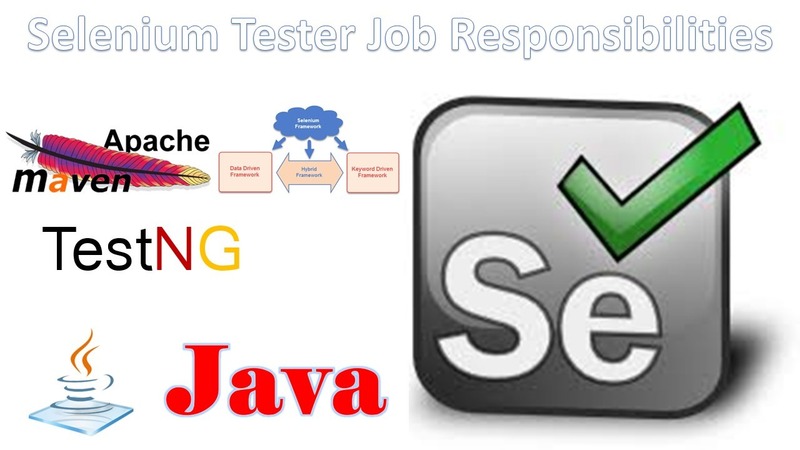 • Creating Test Cases (Test Scripts) using Selenium Webdriver, Java and TestNG Annotations. • Parameterization, Synchronization and define Test results. • Defect Reporting and Tracking using any Defect Management Tool. • Modifying Tests and performing Re & Regression Testing. • Understanding and Analyzing the Application Under Test in terms of Object Identification. • Creating Test scenarios and Collecting Test Data. • Identifying end to end scenarios and code modularity. • Implementing JUnit or TestNG Test Automation framework and developing automation infrastructure. • Creating and enhancing Test Cases (Test Scripts) using Element locators, WebDriver methods, Java programming concepts and TestNG Annotations. • Error Handling, Adding comments. • Creating Data driven Tests and Running through framework. • Cross Browser Testing (Executing test cases against various browsers like Mozilla Firefox, Google chrome, IE and Safari etc…). • Tracking Defects and Select Test cases for Re & Regression Testing. • Modifying Test Automation Resources and Maintenance of Resources. • Choose selenium tools and Configuring Selenium Test Environment (Ex: Eclipse IDE, Java, Selenium WebDriver and TestNG etc…). • Automation Framework Design and Implementation. • Creating, Organizing, and managing Test Automation Resources. • Creating, Enhancing, debugging and Running Test Cases. • Organizing, monitoring defect management process. • Handling changes and conducting Regression Testing. • Finding solutions for Object Identification issues and error handling issues. • Co-coordinating Test team members and Development team in order to resolve the issues. • Interacting with client side people to solve issues and update status. > Inspecting Elements, Create Test Cases using Element locators and Selenium WebDriver Commands. > Enhance Test cases using Java Programming and JUnit / TestNG Annotations.